Sheet navigation in Excel 2013 is slightly changed and on initial viewing you may wonder where some of the buttons have gone. In particular, you might want to know how you get to the very first sheet or the very last sheet. In prior versions, the bottom left of you screen looked like this, with the arrow and line allowing you to get to the first or last sheet in your spreadsheet. Excel 2013 now looks like this, with no arrow and line button. 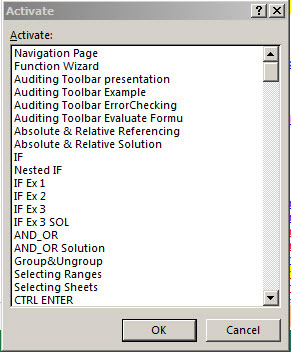 Sheet navigation in Excel 2013 is achieved by either right clicking or holding your CTRL button down. To get to the first or last sheet, hold your CTRL button down and click on one of the arrows. An improvement is the option where you right click on the buttons. Previously it showed a list of sheets and then you had to click on More Sheets to get a full, scrollable listing. Now when you right click on the sheet arrows, you immediately can see all the sheets as shown below.